Maths Challenge Success – A UK wide event consisting of 25 demanding non-calculator multiple-choice problem solving questions that require to be completed within an hour under test conditions. The questions get harder as the paper progresses. A gold certificate is only awarded to approximately the top 6% of all participators, silver to the next 13% and bronze to the next 21%. The following pupils received their certificates at Assembly. Well done to all! S1 Eilidh MacDonald – Best Junior in year, Bronze. Also Hannah Wood & Ian Nelson Bronze. In S2 Mark McLean – Best Junior in School, best in year and Silver. S3 Alfie Gudgeon – Best Intermediate in School, best in year and Silver (Alfie received a Gold at Junior Level in S1). Also Rosie MacKenzie & Joseph Smith Bronze. In S4 Justin Claydon – Best Intermediate in year, Silver. Also Siobhan Vickerstaff Silver, Catherine Wyatt & Sofie Bannister Bronze. S5 Luke Gorman – Best Senior in year, Bronze. Also Eilidh MacLennan Bronze. In S6 Ian Paul – Best Senior in School, best in year, Silver Also Fraser Hinchliff Silver. John Muir Award certificates – There are four sections to the Award: Discover a wild place; Explore it; do something to Conserve it; and Share what you have done. All of S1 has followed a programme of activities to fulfil these objectives including forest school at Inverewe Estate, a beach clean, designing and making bird boxes and activities during the Nethybridge week. They have also carried out research into John Muir, illustrated some of his famous quotes and completed individual record books. To finish the Award, groups gave presentations to the P7 pupils on Friday 7th June. Pupils successfully achieving the Award will receive their certificates at Prizegiving on Wednesday 26th June. First Aid Certificates – S3 pupils were awarded Emergency First Aid Certificates at assembly after completing a one-day course in school at the end of last month. Last week all the other pupils in the school were also involved in a half day refresh of first-aid procedures. DofE news ­ – Two Silver training expeditions are taking place before the end of term. One will be in the Loch Mullardoch area and the other will cross Fisherfield and Letterewe. We also have three Bronze groups taking part in Assessment Expeditions setting out on Monday 17th June. Freya Baptist, Deborah Connop & Charlie Bulmer in S3 have provided two short reports for readers on their Bronze Practice Expedition which followed an initial overnight camp at Slattadale last month: Poca Buidhe was a lot better than our Slattadale Expedition. We had a sunny start but there was plenty of rain so we couldn’t even cross the river to get to Poca Buidhe. We ended up camping a few kilometres before the end. Unlike last time, we were more prepared to keep warm but a lot less prepared with food, the matches got wet and we ran out of fuel and had nearly no food for the second day. Despite our awful cooking and having to walk a lot further than expected we enjoyed ourselves and have learnt a lot for the qualifier on the 17th June! 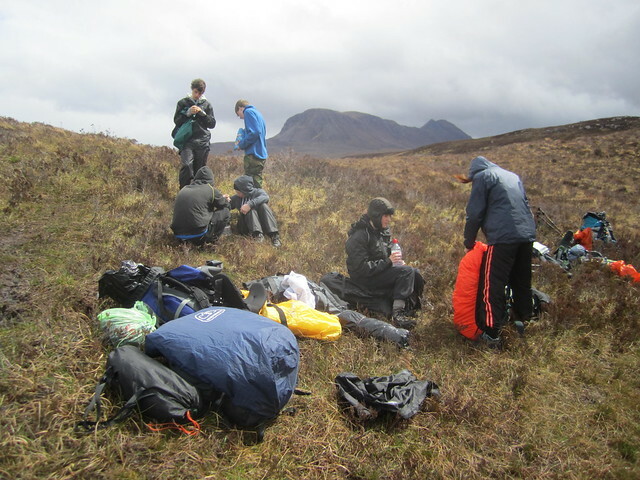 On the 27th and 28th of May another group of S3s took part in their Bronze Practice Expedition to Loch a’ Bhealaich. Our group walked 11km to Loch a’Bhealaich and camped near the edge of it…on heather. The walk was quite good if you were looking for a good view, but we didn’t take notice, as we were tired and hungry. We fed ourselves a wide selection: sausages. The walk back was nice and on the whole it was fun but very tiring. Our qualifying expedition is also on the 17th and 18th of June. Providing this number of pupils the opportunity to achieve Duke of Edinburgh’s Award expeditions involves a great of commitment from staff as well as pupils. The majority of this work is done on a voluntary basis by staff and could not take place without much goodwill. As always we have several photographs taken on expeditions available on the school website. Malawi Partnership – We were very grateful to receive a donation of £750 from Julia Alexander and the Fundraising shop. This is an extraordinary gift based on the generous and unstinting work that Julie puts into keeping the charity shop open. We have also received a very generous donation from members of Mrs. Johnston’s family. We extend our warmest thanks to them all and to everyone who supports the shop. Such support is a great encouragement in our own efforts and makes our vision of a return visit by pupils and teachers from Malawi that little bit more realistic. Whilst pupils have been concentrating on their exams, staff have been continuing with preparations for our visit to Malawi in October. With exams now over, training for the visit will commence with 2 days of activities and planning at Kinlocheil on 14th and 15th June. We will also be continuing with fund-raising activities over the summer. Read more about the partnership here. Basketball success – Jordan Gorman (S3) recently got the award for most improved player for the Highland Bears this year. He is part of the U15 Scotland team. He has already taken part in a tournament in Spain this year and will be playing in an international fixture against Luxembourg in June. Gregor Vickerstaff and Sara Johnston (both S1) represented their club (Highland Bears) at the U14 National Championships in Dundee last weekend. The girls played six games and did especially well, beating or coming ahead of long established teams such as Glasgow Rocks, Edinburgh Polonia Phoenix and Stirling Knights to finish third out of ten. Sofie came 1st and got Show Pony Champion. SQA National Exams – Pupils have finished their national exams again for another year. Thanks to all our invigilators for their help supervising this year’s exams particularly Chief Invigilator Nikki Hayes. Pupils receive their results is August. Important Dates – Prizegiving will take place on Wednesday 26th June from 1.30pm in the High School. Parents and family are welcome to join us for this annual ceremony celebrating the success of the pupils throughout the session. A copy of the letter sent home last week is available here.